The Flawless Bond acts as a 'magnet' pulling together the adhesive and natural lash with a mini wiggle motion. It pulls the adhesive + extension deeper into the natural lash line allowing for a better bond. The Flawless Bond offers a stronghold and a very fast dry time of between 1-2 seconds. All our adhesives offer up to 8 weeks hold, low fumes, and optimal flexibility. When choosing an adhesive you need to take your workplace humidity into account. The Flawless Bond works best at 40-55% rH. Important: The Flawless Bond Adhesive does not do well in temperatures over 23 degrees C, it will become gummy and spoil. The nozzle comes sealed and must be pierced to dispense adhesive. Keep adhesive in an airtight container with dry rice (or silica pack). Room temperature. DO NOT store in the fridge. All adhesives should be shaken for 3 minutes prior to use. The nozzle comes sealed on all Flawless Bond Adhesive bottles, and must be pierced to dispense. 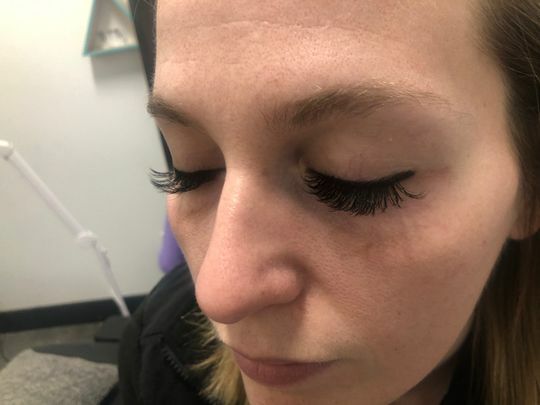 Isolate natural lash before picking up or dipping extension. Once isolated, dip 2-3mm (classic lashing) or 1-2mm (volume lashing) and bring right to the natural lash. Do not shimmy or "paint" the natural lash with the adhesive. Simply press this adhesive to the natural lash base and hold for one second. Sticky/Goopy - Your adhesive is spoiled due to improper storage. Separated - Your adhesive is compromised due to heat or moisture. Has a whitish haze on the lashes after misting - This is called blooming/frosting. You may have cured the adhesive bonds too quickly. You can try misting and fanning throughout appointment. You may also want to skip the Primer. Poor retention -Improper storage or controlled workspace humidity. Might need to buy less more often to keep from spoiling. Humidity Issues - When choosing an adhesive you need to take your workplace humidity into account. If your environment isn't ideal, don't worry, you can use a dehumidifier or humidifier to help you find that sweet spot (use our Hygrometer to check the %). If you're still struggling to control your humidity we recommend using the Elite Bond over the other adhesives as it works well in a wider range of humidities from 20-75% rH. If humidity is too low, the adhesive will work slower. Whereas, if it's too high the adhesive will be speed up which may potentially be too quick to place in time for a good bond. Shelf Life - All our adhesives have a 3 month shelf life when unopened. After opening they're good for 6-8 weeks. Freezing - You can freeze unopened adhesive for up to 12 months. To defrost, leave at room temperature for at least 4 hours before use. Shelf Life - All our adhesives have a 3 month shelf life when unopened. After opening they're good for up to 6-8 weeks. *** In the event, you choose to place an adhesive in the freezer your return policy will be void. As we can not guarantee a product that may have been spoiled due to freezing. Works better for classic and it takes more processing time for me compare with candy glue. Thank you for the photo Mitrs! Brilliant we are so happy to hear! Thank you for sharing this photo! NOT for drier climates. Great Retention. My relative humidity is 40% and dry time was at least 5-7 seconds. Way too slow for efficient time. Cool magnetic action, seamless results. Great retention. Crazy expensive. Do not use at 40% RH or below. Would only recommend for retention, in higher humidity for slower artists. Thank you for your feedback Ashley !